Vilnius Regional Administrative Court has rejected the application of Lucyna Kotłowska, director of the Administration of Vilnius Region Local Government, concerned with the question of bilingual plates. Lucyna Kotłowska appealed for explanation and answer to the question: Who is to execute the court’s decision regarding the plates with non-Lithuanian strret names- the director of local government’s administration or a bailiff ? The court decided the application of Lucyna Kotłowska to be groundless. ” Director of the Administration of Vilnius Region Local Government does not aim at explaining the court’s decision but instead, she doubts whether it is her obligation to execute the decision in question”- such was the opinion of the Vilnius Regional Administrative Court’s judicial council reported by the press officer Sigita Jacinevičienė-Baltaduonė. What the judicial council has decided was that they cannot examine the director of Administration of Vilnius Region Local Government’s application since Vilnius Regional Administrative Court is not an institution responsible for any explanations to the sides of the case or instructions how they are supposed to follow the court’s decisions. Lucyna Kotłowska has been already penalised for a few times for placing bilingual plates within the Vilnius Region. This time the case concerned the verdict of the Vilnius Regional Administrative Court from 24th November 2010. 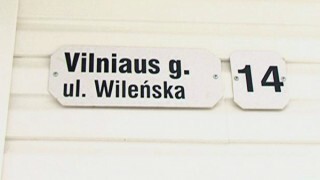 Lucyna Kotłowska was then ordered by the court to remove the bilingual plates with street names in such villages as Pikieliszki, Podbrzezie, Mejszagoła, Suderwa, Orzełówka, Niemenczyn, Bujwidze, Mościszki and Ławaryszki. Owners of the buildings ordered the plates at their own expense. Despite the court’s decision, they refused to remove them. On some of the private buildings in the forementioned villages plates containing a Polish street name have survived until today. Lucyna Kotłowska has therefore appealed for explanation how to act in case of private possession.